Quality coordinators are found in a wide range of industries. Their goal is to guarantee that proper procedures are followed and that products and services are free from errors. The coordinator essentially functions as an auditor, working to maintain compliance with company standards and industry regulations, as well as local and national laws. They also help to reduce costs by pointing out areas of needed improvement within the system. The evaluation process is a daily exercise in the overall effectiveness of products and services. A quality coordinator is crucial for the production process. They develop extensive inspection plans to ensure that a product is manufactured properly. They may test product components before they are used, test the completed items, and analyse problems with returned products. If there is an issue on the factory floor that has lead to quality problems, they work with other employees to solve it, training them on the best practices and making sure they are followed. What is it that you do? I work as a quality coordinator. I deal with internal audits, investigation of customer complaints, training, quality checks, verification of equipment and consumables. Why did you choose this profession? I was accepted to study a BCom and Food Technology. I did further research about both career options and felt that food technology would be more interesting and challenging. The microbiology component also intrigued me. Food technology is a versatile career. 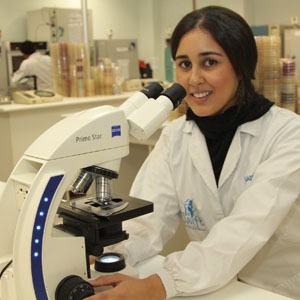 One can work in a chemical or microbiology lab as a product developer, where you would develop new products, match existing products or reduce costs of an existing product without compromising taste and quality, or on the production floor, where you are expected to manage the production line or work as a quality controller. What training did you undergo? I did food technology at the Cape Peninsula University of Technology. Describe a typical day High pressure and challenging. Planning is key. In the morning I verify that the equipment is in operating order, that the temperature is in spec and may be used. Thereafter, I check that the media used to analyse products has passed its quality sterility indicators – that’s standard every day. Then there are other duties like spot checks and audits, investigation of non-conformances, training, etc. What do you enjoy most? Each day is different and presents new challenges. You always have to think out of the box. Anything you don’t like? Long hours. Whether you work in a lab or production, your work hours are not always set. If there is a problem on the production line or in the lab, you need to ensure that the problem is fixed. You can’t fix it the following day. Products need to be produced for customers to consume. If you are analysing products, the client always wants the results ASAP. What hurdles have you overcome? Self-discipline. I recall my lecturer saying that Food Technology is one of the busiest courses at the campus. You have to focus and study while everybody else on campus is playing dominoes and shooting pool. It was all worth it though. The highlight of your career so far? When Swift won the SADC Quality Award for Service of the Year. The award system was established by government through the Department of Trade and Industry, with an aim to promote and raise awareness about the need for quality assurance, quality management and the different methods on how to achieve such quality standards. The award reflects commitment to local production and quality. Experience versus training: who wins? You really start learning when you start working. I would recommend studying at a university that offers experiential learning as part of the course. That time spent can also help you decide which field of Food Technology you should pursue. A food technologist is… Able to work under pressure and meet deadlines, to operate with a team, as well as independently. They must have a big dose of patience and understanding, and a passion for the task at hand. The education required to become a quality coordinator depends on the specific industry. In a consumerable goods environment, a quality coordinator usually needs to hold a Bachelor of Science degree or diploma in Food Science or Technology to work in this field. A National Senior Certificate is a prerequisite for doing these courses of study. Experiential training in a food manufacturing company or retailer would be an advantage. Some courses of study combine theoretical and practical training with in-service training at an approved place of employ in the food industry.